Hey Lovelies! It’s day 7 of Blogmas! What do you think of blogmas so far, with all those Pokémon?! It’s time for a new ornament! Today we will make a Ditto who has gotten in trouble with the lights. Instead of decorating the tree, he decorated himself xD. So cute! ♥ Felt in the colors Pink, Red and Green. ♥ Acryllic Paint in Black. ♥ about 50 cm of black yarn. Copy all te pieces to felt, part A you’ll cut out of Pink felt. Part B you’ll cut out of green and red felt. About 14 times total. You can do more or less, or use other colors for the light. But red and green always gives me that Christmassy feeling. When you’ve done that it’s time to sew both parts A to each other. 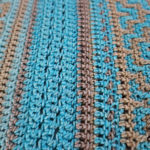 Use a Blanket stitch to do so. Before almost completely closing it up, make sure you stuff the body. After finishing sewing the body, paint on the face of ditto with some black paint. Now the fun part, wrap ditto in the black yarn. You can do this however you like, and how much yarn you use is up to you, 50 cm is probably too much. 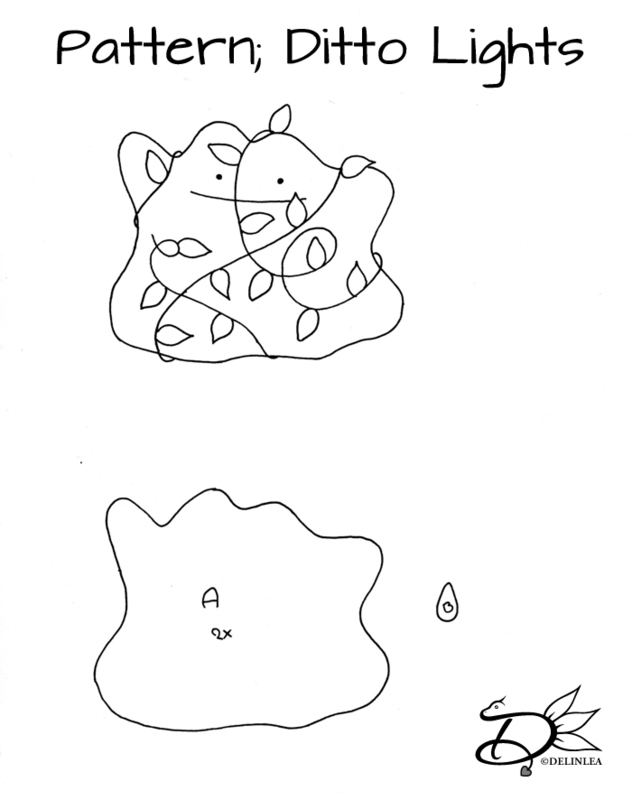 You can glue the yarn to ditto if you like, or just in some places, or even just the start and ending point. Time for the lights! glue this here and there to the black yarn. Just do this random, to spots you like. And you are already done! This is a pretty quick one, but I love it so much! I hope you do to, and make him as well. And if you do so, don’t forget to show me with #DelinleaBlogmas2018DIY on twitter or Instagram. Have a lovely day, and I’ll see you tomorrow again! Hey Lovelies! It’s day 6 of Blogmas! I kept it simple today, but I think it’s very cute to hang them in your christmas tree! Defenitly if you make a lot of them, maybe also in different versions?! You’re curious now, right?! 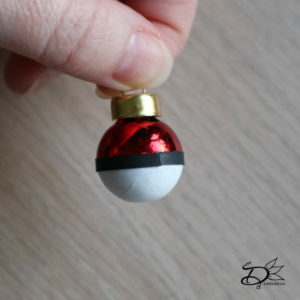 Let’s make a Pokeball Bauble! ♥ A Red Bauble in any size! ♥ Black and White Paper. Paint the bottom part of the bauble white, about half way. You maybe need several layers. Let it dry completly! Cut out a stroke of black paper. This will be for the part where the pokeball normally opens. The width and length of the stroke depends on how big your bauble is! Just do what looks best. Glue this around the bauble, in the middle. Where the red and white meets. Cut out 2 circles. A big one out of black paper, and a slightly smaller one out of white paper. 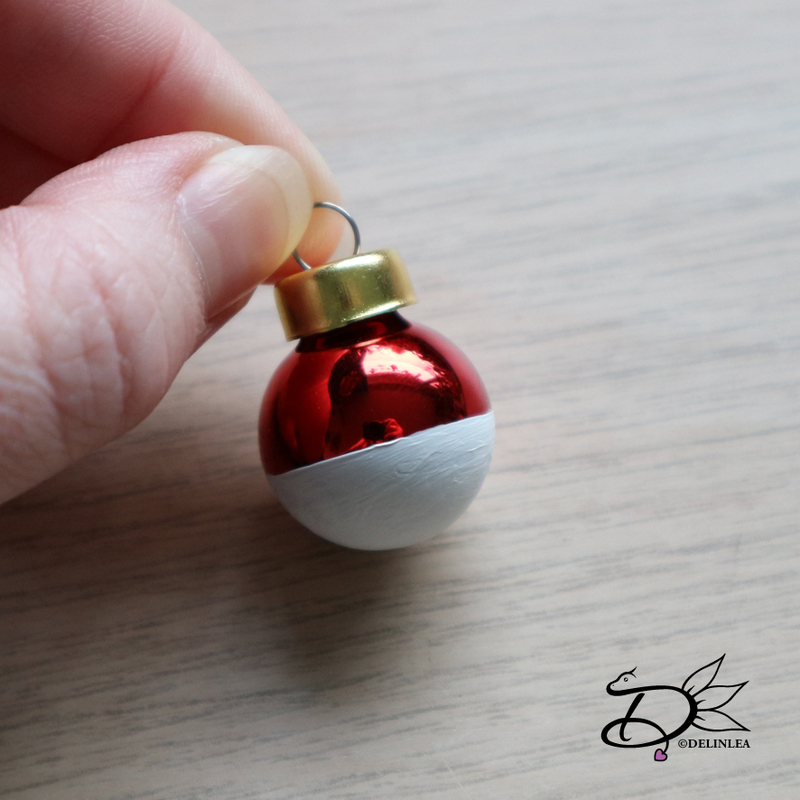 Glue the white circle to the black circle and glue those to the bauble, where the ends of the stroke of blank paper meets. And you are already done! 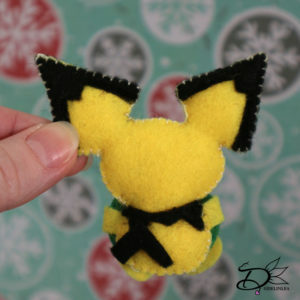 it’s cute right, imagine this one, with plenty others in your christmas tree! Maybe different versions! Be creative and have fun! See you tomorrow again! I hope you enjoyed this DIY, and if you make it share with #DelinleaBlogmas2018DIY on twitter or insta! 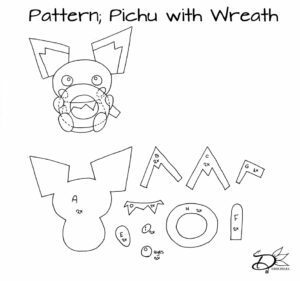 Today we are going to make a Pichu who’s holding a wreath. I love it, let’s go~~! ♥ Felt in the colors Yellow, Black, Green and Pink. ♥ Acryllic Paint in Red and White. 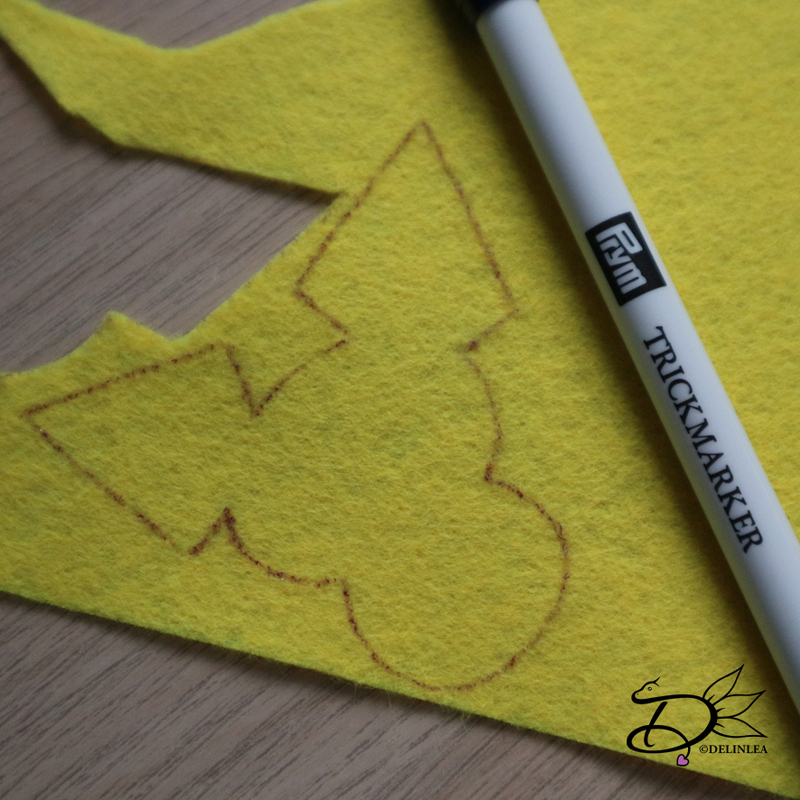 Use a trick marker or anything else you can copy the pattern with on to the felt. 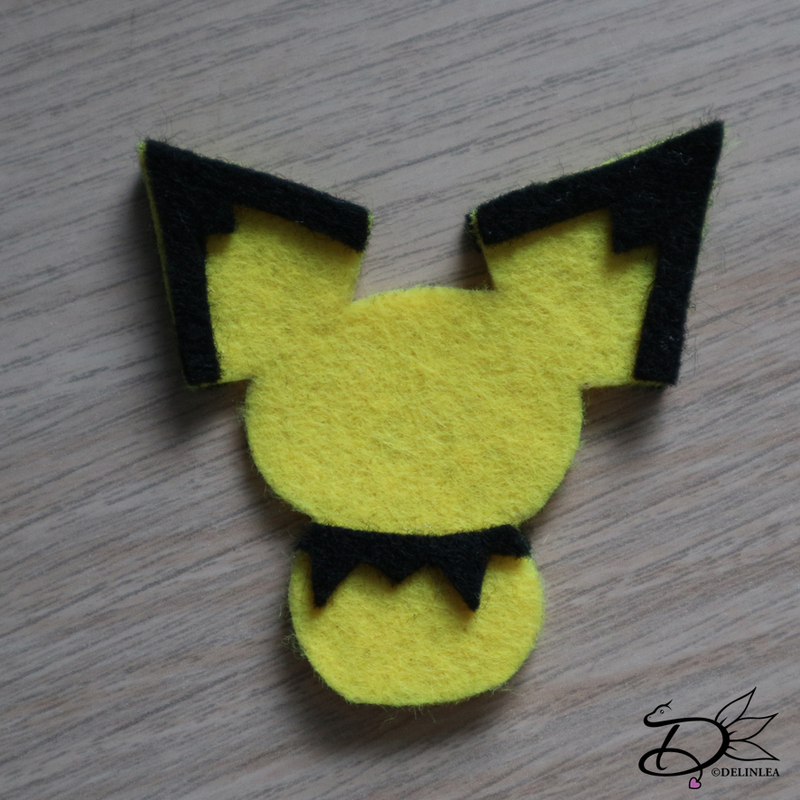 Cut Parts A, E and F out of yellow felt. Parts B, C, D, G and the eyes out of black felt. Part i you’ll cut out of pink and part H you’ll cut out of green felt. Make sure you’ll cut out the right amount of every piece, the way it’s stated on the pattern. Don’t loose track of which piece is which. On part A you’ll position parts B (left ear), C (right ear) and D on the right places. You can use a tiny bit of glue to keep them in place. 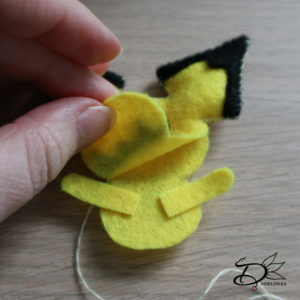 Then start sewing at the right ear with a blanket stitch. Make sure before closing the first ear, that you’ll stuff it already! You will get in trouble if you don’t. Just go along the edge of the head, the other ear, and do the same for the other ear with stuffing. Before you start closing the body, make sure you place the arms (part F) in between the layers. 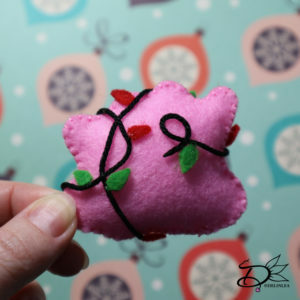 and use a running stitch to keep the in place, sew the rest of the body with the blanket stitch. And before entirely closing it up, stuff the head and body. Glue the eyes and the cheeks to his face, and with a white dot of acryllic paint you’ll bring the eyes alive. 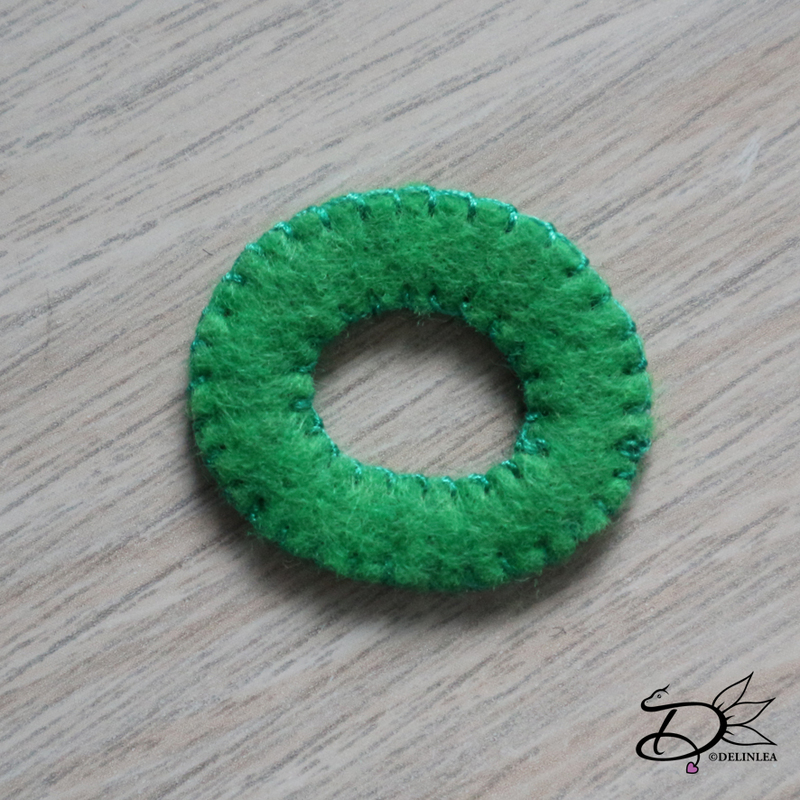 Sew both part H togheter with a blanket stitch, both the inside and the outside of the wreath. When you are done, paint red dots on there (little berries). You can put a tiny white dot in every ‘berry’ for a bit of shine. 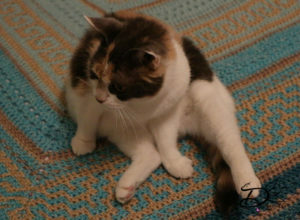 Position the wreath and glue it to the body. Then glue the hands around the wreath. 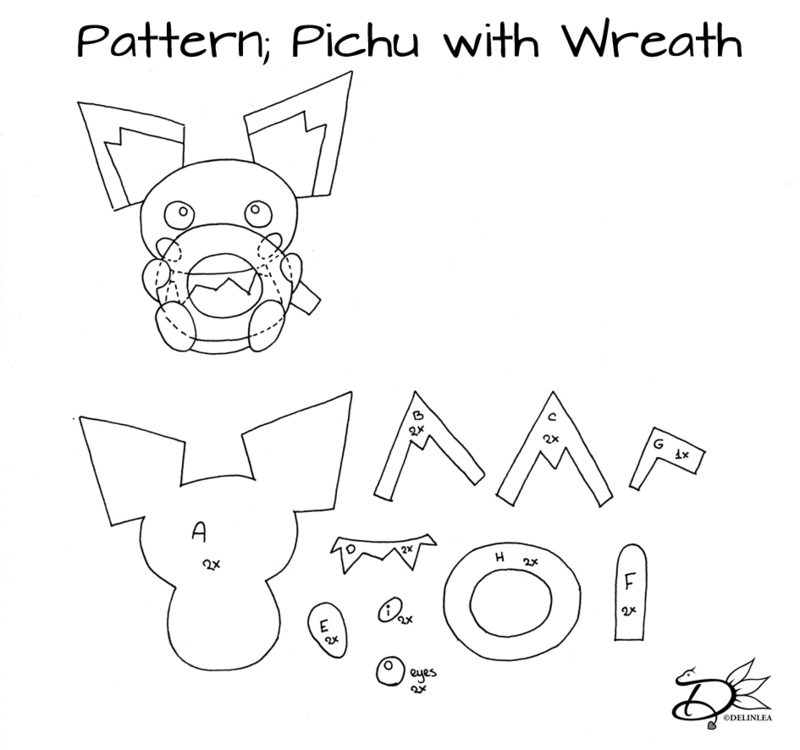 On the wreath you’ll glue the feet (part E) and the tail (part G) on his back. And another felt ornament is ready! cute right?! Share yours with #DelinleaBlogmas2018DIY on twitter or insta! I will see you tomorrow again! Have a nice day! First of all, I was scared this challenge would come. 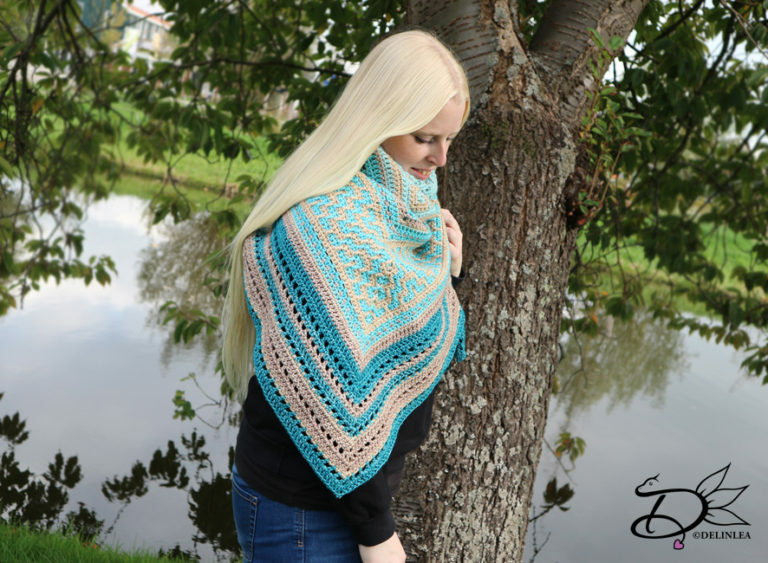 I never made a triangular shawl before. Well ones before, from a pattern. But that took me ages to make! And we had just 3 weeks for this one. HOW?! I really needed to come up with an idea! Allereerst was ik zo bang dat deze opdracht zou komen! Ik had nog nooit een omslagdoek zelf bedacht. Wel 1 keer een van een patroon gemaakt, en daar hield het op. Het heeft me heel lang gekost om die af te maken en nu hebben we maar 3 weken. HOE DAN?! Ik moest echt snel met een idee komen! 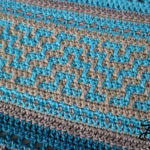 I saw mosaic crochet before, and I love those patterns they made with it. But how do you do that?! I never done it before, but it looked okay to try. Also what colors do I want. I wanna make something that I would wear, so the colors need to be close to me. 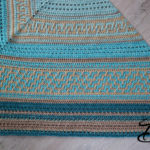 Then I remembered a blanket that used turquoise and some brown, sandy tones. I knew I wanted to go for those colors. I could choose for stylcraft yarns again, but I did that for several challenges already and really wanted to try something else. A lot of yarns I could pick from where with wool, and I am not a person that likes wool… So I went for Yarn & Colors Super Charming. Such pretty yarn, a bit like Scheepjes Stonewashed only thicker. 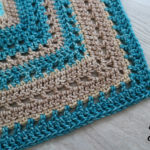 Ik heb wel vaker mosiac haken gezien, en ik vindt het zo mooi wat ze daar mee maken. Maar hoe doe je dat?! Ik heb dat zelf nog nooit gedaan, maar het zag wel makkelijk om te proberen. En ook kleuren, wat wil ik?! Ik wou wel iets maken wat ik zelf ook zou willen dragen, dus dan hoef ik niet met fel roze aan te komen. Toen herinnerde ik me een deken in turqiouse en zand kleurtjes. En toen wist ik dat dat het ging worden! Ik kon weer kiezen voor Stylecraft garen, maar dat heb ik al voor meerdere opdrachten gebruikt, dus wou ik nu voor wat anders gaan. Veel garens waar we uit mochten kiezen waren met wol, en daar hou ik zelf niet zo van. 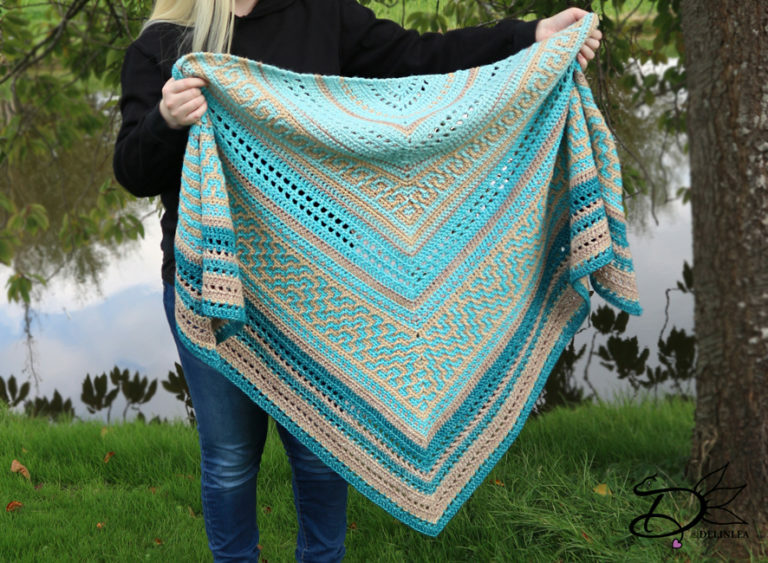 Dus ben ik uiteindelijk gegaan voor Yarn & Colors Super Charming, heel mooi garen! Een beetjes zoals Scheepjes Stonewashed. 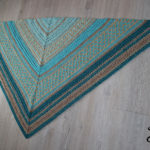 With starting the triangular shawl, it went kinda smoothly, it was getting a nice triangle, nothing really bothered me. And then there was the Mosiac part xD Gah! I thought I can do this in one go xD NOT. At first I had chosen a pattern that was impossible with this technic, so I had to go for something else. That went well, the first part was finally done. Aan het begin van mijn omslagdoek ging het vrij makkelijk, de driehoek werd mooi, niks aan de hand. Tot het mosaic gedeelte xD ha! Ik dacht dat doe ik even, NIET. Eerst had ik een patroon gekozen die onmogelijk was met deze techniek, dus moest ik iets anders kiezen/ontwerpen. Gelukkig gind dat wel goed, en het eerste mosaic stuk was klaar. I also noticed my yarn went pretty quick, so I had to make those hole thingies to make sure I would end up with the right size. the second mosaic part didn’t went well either. Wrong choise of pattern again, teehee, so had to undo a pretty big part and start over again. Ik merkte ook dat mijn garen vrij snel ging, dus moest ik wel gaatjes maken in mijn patroon, iets wat ik eerst niet echt wou. Maar ik moest eindigen met het juiste formaat, dus ja, moest wel. Het tweede mosaic stuk ging weer niet goed, verkeerde keus van patroon, alweer, teehee. Dus moest ik een flink stuk uithalen en overnieuw beginnen. When I finally finished I was so happy with it, only it got a bit round at the top part, instead of straight. So I had to block it.. something I never had done before, and is was so big (185 by 135cm), how a where am I gonna do that?! The solution was in a youtube video, simply cardboard, now fancy stuff needed. And that went well, it only took ages to dry xD. Oh well. I’m happy with how it looks, it’s so warm, perfect for the winter times. Toen ik eindelijk klaar was, was ik zo blij met het resultaat. Alleen had het iets van een bolling aan de bovenkant. Dus moest ik het blokken, iets wat ik nog nooit gedaan had, en hij is nogal groot (185 bij 135cm). Hoe en waar ga ik dat in vredesnaam doen?! Het antwoord lag in een youtube video, gewoon karton, geen fancy spullen nodig. En dat ging goed, het duurde alleen heel lang voor het droog was xD Ach ja, Ik ben blij met hoe het er nu uit ziet, het is lekker warm, perfect voor de winter. What do you think of my design?! Something you will make? Wat vindt je van mijn ontwerp?! Iets wat jij wilt maken? Hey Lovelies! Today, for day 4, I will keep it a bit simpeler~ Well al lot simpeler xD. 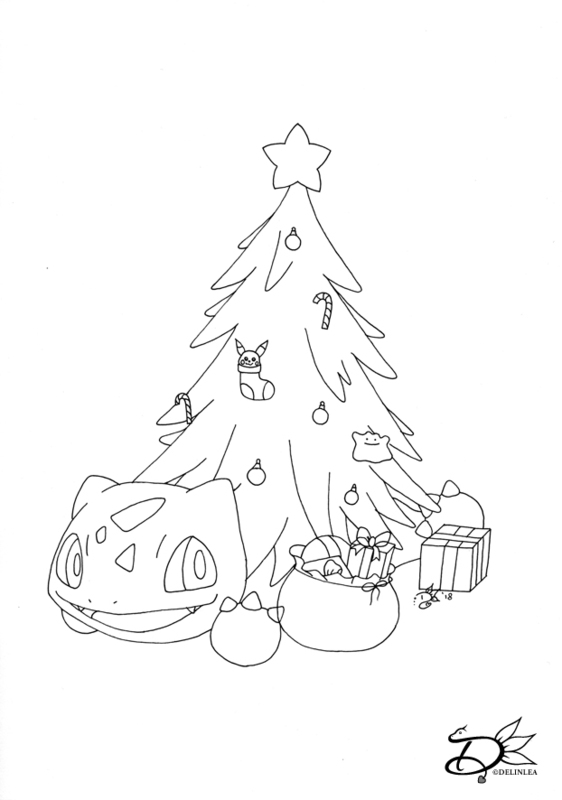 Here’s a Coloring Picture of Bulbasaur with a Christmas Tree on his back for you to download. As you maybe noticed, it’s similar a lot, right?! well I based it on the coloring picture I drew by the Rudolf Accident Amigurumi I made in one of the challenges of ‘De HaakSTER van Nederland’. The Blog post about that you can find HERE. There you can also download the rudolf version on this coloring picture! 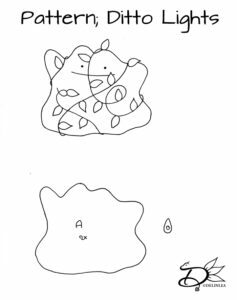 Have fun coloring! Relax a bit! And don’t forget to share with #DelinleaBlogmas2018DIY on twitter or insta!